April 30 President Nixon announces the invasion of Cambodia, triggering massive protests on many of the nation's campuses. 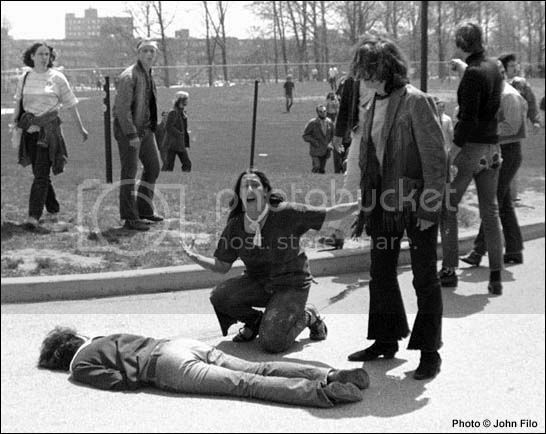 May 2 Ohio National Guardsmen are sent to Kent State after the University's Army R.O.T.C. building is burned down. May 3 Ohio Governor James A. Rhodes personally appears on campus and promises to use "every force possible" to maintain order. Rhodes denounces the protesters as worse than brownshirts and vows to keep the Guard in Kent "until we get rid of them." May 4 Four students are killed and nine others are wounded when a contingent of Guardsmen suddenly opens fire during a noontime demonstration. July 23 Key portions of a secret Justice Department memo are disclosed by the Akron Beacon Journal. The memorandum describes the shootings as unnecessary and urges the Portage County Prosecutor to file criminal charges against six Guardsmen. July 31 Attorney General John Mitchell says that both students and Guardsmen apparently violated federal laws and hints that a federal grand jury may be convened "if Ohio authorities do not act." August 3 After consulting with top Guard officials, Governor Rhodes orders that a "special" state grand jury be empaneled. October 4 The President's Commission on Campus Unrest concludes: "The actions of some students were violent and criminal and some others were dangerous, reckless, and irresponsible." The shootings are branded as "unnecessary, unwarranted, and inexcusable." October 16 The "special" state grand jury exonerates the Guardsmen, but indicts 25 individuals, mostly students, for a variety of offenses that occurred on campus before the shootings. Late October-November Demands for a federal grand jury mount after it is revealed that the "special" state grand jury ignored key evidence and that one of the "special" prosecutors told a newsman he felt the Guardsmen should have shot more students. November 30 Assistant Attorney General Jerris Leonard confirms that the Justice Department is reviewing the evidence to determine if a federal grand jury should be convened. Leonard promises a decision before the year is over.